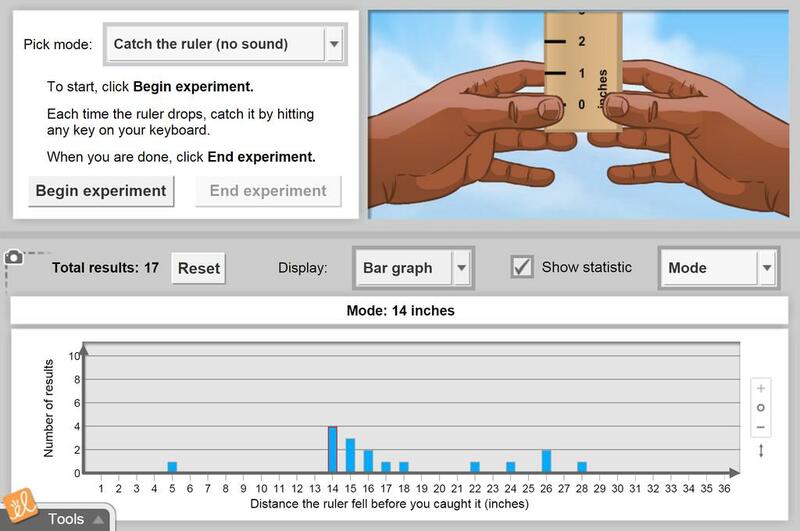 Test your reaction time by catching a falling ruler or clicking a target. Create a data set of experiment results, and calculate the range, mode, median, and mean of your data. Data can be displayed on a list, table, bar graph or dot plot. The Reaction Time 1 Student Exploration focuses on range, mode, and median. Read and interpret data on a list, table, bar graph, and dot plot. Determine basic statistics including range, mode, and median of a data set. This activity uses the reaction time data to perform a standard deviation and z-score to compare sight vs... (more). sound reactions. I used this for my upper classman Physiology as an introduction to the nervous system and it worked well. Using this Gizmo, students can collect, graph and analyze REAL TIME DATA, and have fun doing it! Amazing for mean, median and mode! So engaging for students to make sense of data! Physiology Nervous system. This worked well with a few modifications.